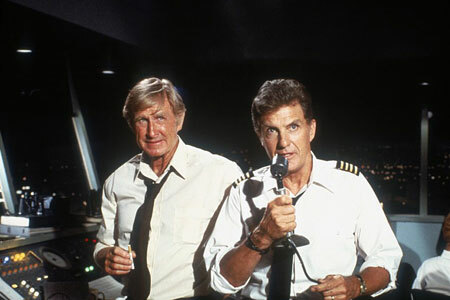 My Favourite Films #7: Airplane! That simple, daft gag is one of the most famous moments from Airplane! and is possibly one of the most well known comedy lines in cinema history. Its also an example of what makes this film so brilliant, yes the jokes might be daft, even childish at times, but its a film that can make you laugh on repeat viewings and deserves its reputation as a comedy classic. 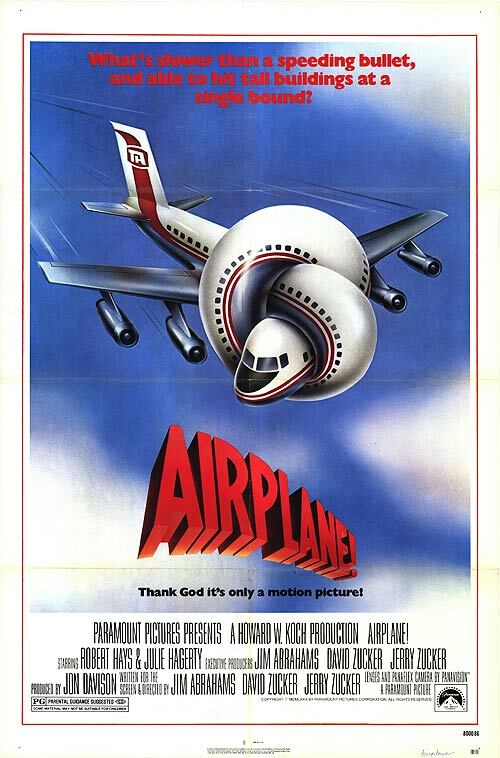 Spoofing the 1970s disaster movie cycle it concerns an LA to Chicago flight which runs into problems when the crew are struck down with food poisoning. The only hope is Ted (Robert Hays) an ex air force pilot who’s confidence has been shattered by his experiences during “the war”. He’s onboard to try and win back his love, Elaine (Julie Hagerty), an air stewardess. Can Ted overcome his demons and land the plane safely? The plot is basically just there to allow them to poke fun at genre conventions and link all the scattershot gags, but as opposed to the 2000 spoof cycle (Scary Movie etc.) the film works because it sticks to one major plot which is the framework for all of the jokes, rather than just stringing together a sequence of nods to other movies. Its a much better way of doing things as despite the relentless speed of the jokes being thrown at the audience there is still a structure to follow and it makes sense. The narrative also follows the genre its spoofing, the ensemble disaster flicks which were booming in the 70s (Airport, The Poseidon Adventure, Earthquake, The Towering Inferno). In fact, the film is loosely a remake of the 1957 flick Zero Hour! only turned into a comedy, and uses the traditional genre conventions like the hero overcoming personal demons (it also lifts dialogue from the film, with the “The life of everyone on board depends upon just one thing: finding someone back there who can not only fly this plane, but who didn’t have fish for dinner.” line being scarily close to a proper line). One of the film’s major strengths is its elder statesmen cast- Robert Stack, Peter Graves, Lloyd Bridges and Leslie Nielsen, who were mainly known for their serious, mainstream roles (Graves was the lead in the Mission: Impossible TV series, Stack was Eliot Ness in The Untouchables TV show). I’ve read differing accounts that say not all of the cast got what the makers were going for, but if they didn’t their ultra serious deadpan delivery of much of the dialogue only serves to make the film even funnier. Nielsen and Bridges both came from serious old school Hollywood backgrounds (between them they appeared in films like The Poseidon Adventure, High Noon and The Forbidden Planet) but seemed to easily get to grips with the film’s ridiculousness and would continue to work in the spoof genre, with Bridges appearing in Hot Shots! while Nielsen would become king of the genre, appearing in the Naked Gun series along with several other spoofs. 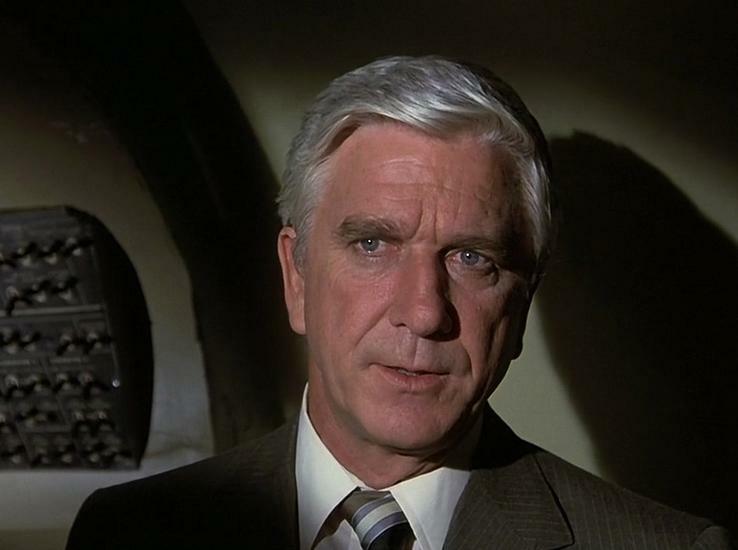 The late, great Leslie Nielsen, king of the spoofs. 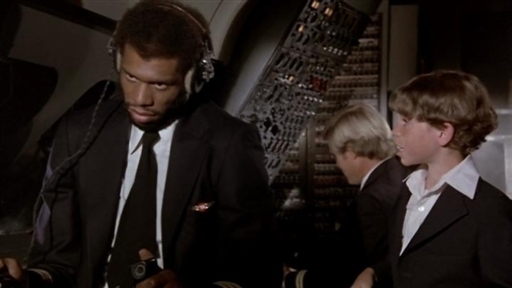 Another great piece of casting was LA Lakers basketball star Kareem Abdul-Jabbar as the co-pilot, which could be seen as a nod sportsmen like OJ Simpson, Jim Brown and Fred Williamson appearing in films, and results in one of the movie’s funniest scenes where Abdul-Jabbar, having been criticized by a young boy breaks character and angrily justifies his sporting performances. Its a funny moment because of the sheer randomness and the kid’s reaction to Abdul-Jabbar’s rage is brilliant, like much of the humour in the film it doesn’t make any kind of sense. The real gift of the film is the script, which whips along at a hell of a clip and keeps up a steady stream of gags, there’s a kind of “Didn’t like that joke, don’t worry, there are 3 more on the way” approach and it mixes delightfully daft puns and wordplay in with slapstick and bizarre visual gags. There are odd little throw away gags along with some nice running jokes (Lloyd Bridges’ “Looks like I picked the wrong week to…” and the jive talking passengers spring to mind). The deadpan deliveries also take their place along some quality OTT comedy acting. There’s also an undercurrent of darker, more grown up humour including children delivering adult dialogue (“No thank you, I take it black, like my men”) or the uneasy questions that Captain Oveur (Graves) asks the young boy who visits the cockpit. Its one of those films where its hard to select good moments to discuss because there are so many you’d wind up just writing an extremely long list. Its rightfully regarded as a classic movie and routinely ranks highly on lists and polls to find the funniest films, and it deserves all those plaudits. If you’ve never seen it before I urge you to check it out because it’ll have you crying with laughter, and if you have seen it before watch it again because it definitely stands up to repeat viewings.